Ronny Deila's future as Celtic manager could be decided if they lose to Rangers in the Scottish Cup semi-final, says ex-Hoops striker Frank McAvennie. "[Celtic chief executive] Peter Lawwell and [majority shareholder] Dermot Desmond are the only two people who are going to decide Ronny's future - if it hasn't been decided already," he said. "If they get beaten by Rangers then it will be decided. "Celtic haven't been playing well at all but I think they'll be too strong." 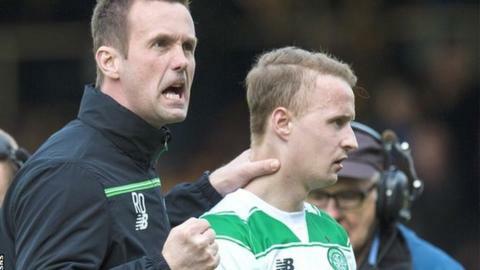 Despite Celtic moving eight points clear at the top of the Premiership with five games left, many believe a second straight title - and even a league and cup double - may not be enough to maintain Deila's tenure into a third season. "I think he's on a hiding to nothing to be honest," McAvennie told BBC Scotland. "You can see the frustration on his face and the delight when he gets the results. You can just see the emotion coming out on his face. "It is not thinkable that he would let Rangers - from a lower division - beat them. The supporters won't allow that. "But Ronny knows that. They should have done what Rangers have done and won the league by now. "They are not good on the eye, but they are still winning. They are getting over the line and they will win the league. "I think Aberdeen have had enough chances this year when Celtic have messed up, but they have not capitalised on it." McAvennie believes the Hampden pitch - which was due to finish being relaid on Tuesday - "will be a great leveller" on Sunday, against a Rangers team that have closed "a big gap" since the sides last met in last season's League Cup semi-finals. He maintains that the national stadium should be preserved for the Scotland team and major occasions such as cup semi-finals and finals rather than used every fortnight by League Two club Queen's Park. "I am one of the old school," he said. "I think a national stadium should be a national stadium. I don't think amateurs should be playing there. "I know the boys at Queen's Park will say we always play there, but Lesser Hampden is beautiful. I don't know why they don't play there. "There were 413 people at their game last week. "England have a national stadium, Wales have a national stadium, Scotland should have a national stadium and the pitch should be beautiful. "There is no-one else to blame except the powers that be at Hampden." Who's responsible for the Hampden pitch? League Two club Queen's Park own Hampden Park and play their home fixtures there as part of an original lease agreement that expires in 2020. Queen's Park lease the stadium to the Scottish FA, which assigns running the stadium to Hampden Park Ltd, its wholly-owned subsidiary. HPL board members include SFA office-bearers Stewart Regan, Alan McRae & Andrew McKinlay. The current pitch was only relaid in early March, ahead of the League Cup final on 13 March. Celtic defender Mikael Lustig admits all the pressure is on Celtic ahead of Sunday's clash with Rangers because they should win the match. "We should have the better players and better team, so I can see why people say that," said the Swede, who played in last year's 2-0 League Cup semi-final win. "We haven't played so good and we know we could play better football, absolutely. "Last time, they didn't get promoted and this year they have had a better season, so maybe."